I doubt it, since its behind that wall. However, it could be for access to some other vital part of the construction. e.g. one trackpiece was fastened to another trackpiece, but it was not fastened to a support that was perfectly lined up with that piece. It is now fastened, but it took like a week for that to happen. If often is - that's usually the biggest reason to why some coasters appear to go up in a 'random' order. That being said, I had a quick skim through the other pictures and couldn't see any way they'd want that area for access. It's right on some of the steepest grade on the site. The other option is that the support is not required for the track to sit there, and only needs a smaller crane to install it. They're holding off while they move the bigger pieces in with the bigger equipment, and will then go back with the smaller equipment later. My best guess, at least. That's probably it. Would be logical, since they have only worked on the parts that are next/below the station. 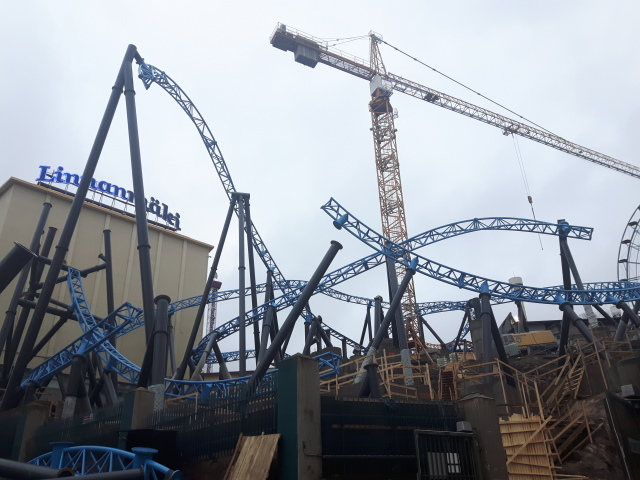 The helix, second launch, tophat and diveloop/immelmann hasn't even gotten more work than some supports that were built before the 2018 season, so that it would be out of the way and the only thing required was supports and track. Pokemaniac, Temleh, Matt N and 3 others like this. This ride is taller than I was expecting. I agree; the bits of track that are there make it look like it's going to be very tall! I knew it was 170.6ft tall, but I don't think I quite knew how tall it would actually look! Wow that site is great! I don't think I'd ever really given enough thought to how steep it is, but that picture showing all of the temporary stairs really shows it well. I'm actually really excited for it. Pokemaniac and vaugc002 like this. At the beginning some people said this could be the best in the world, then excitement died down and now it's back up. I do think we could have a top-10 coaster here. For sure it will hit some enthusiasts top 10, but bearing in mind where it is, those who make the effort to get to Finland are likely to have reasonably high counts with very respectable top 10s already. It looks good, but nothing about it is giving me the Taron vibe so far, already indicating lower top 10 for me, and it would have to be something special to go in any higher than Goliath. I hope it proves me wrong and is balls-to-the-wall amazing but I'm curbing the enthusiasm for the time being. PetskuC, Ethan and Hixee like this. I could believe it, you know. I'm reluctant to say for sure, as a lot of these launchers are hard to tell until we see it running (the speed - and therefore pacing - is the crux of it I think). This'll be one of the top coasters in Europe, I reckon. At least, in terms of what appeals to me. vaugc002 and DelPiero like this. PetskuC and Hixee like this. b&mfanboy123 and DelPiero like this. PetskuC, Pear, vaugc002 and 1 other person like this. For sure it will hit some enthusiasts top 10, but bearing in mind where it is, those who make the effort to get to Finland are likely to have reasonably high counts with very respectable top 10s already. Yeah, it's a burden to get here. The fact that there really isn't any other great coasters here except for quite a lot rare credits (one of the only two Intamin inverts, the first gci outside of the US, the only Mack e-motion still operating and a side-friction Woodie with brakemen (that ACE considers a "classic").) 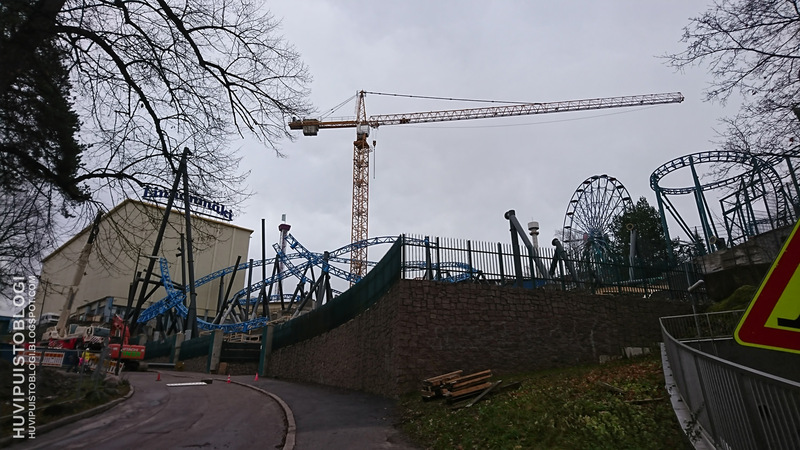 otherwise everything is just kinda meh except for a Gerstlauer launched Eurofighter (Junker, Powerpark). 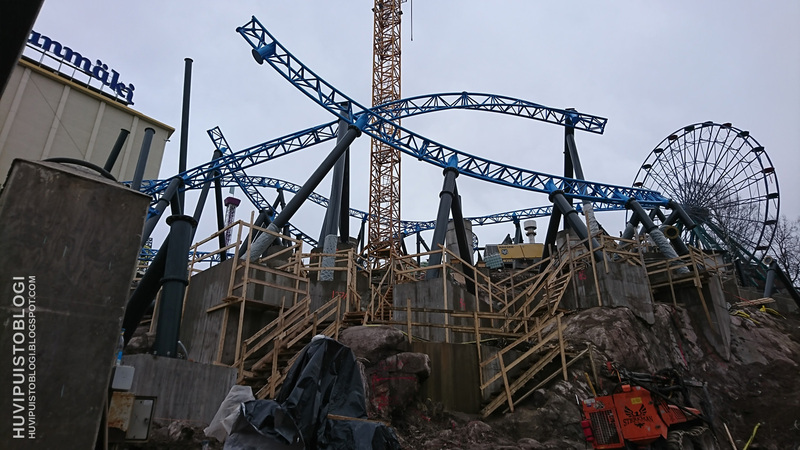 Really hope that Taiga will bring more enthousiasts here, like Sweden did with Wildfire and Helix. ^^ One of my first bigger coaster trips was actually Finland back in 2012. While there wasn't many coasters I would consider top-ten material, there was a really diverse selection of ride types, which is what makes it a good trip to do in my opinion. Flights from Copenhagen to Helsinki are reasonably priced as well, so I'm seriously considering doing a weekend there once Taiga opens, which already looks so good. Lofty, Coaster Hipster, b&mfanboy123 and 4 others like this. The Immelmann is almost complete, same for the first inversion. you can even see two supportbeams that aren't connected to anything. I speculate these will be used for the immelmann. They have started to put up more supports, this time on the other side of the service road. 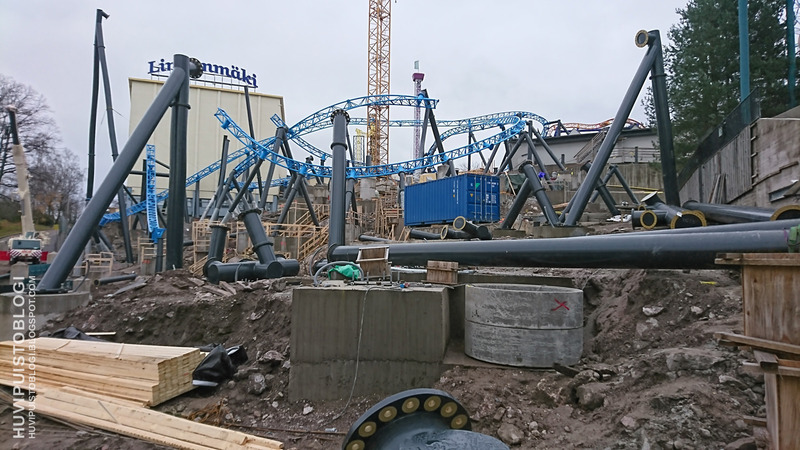 They already have supports for all the turns here, so now they only have to install the track so that the two halves connect. Another angle from the immelmann, the hearline-roll and the first janky inversion. 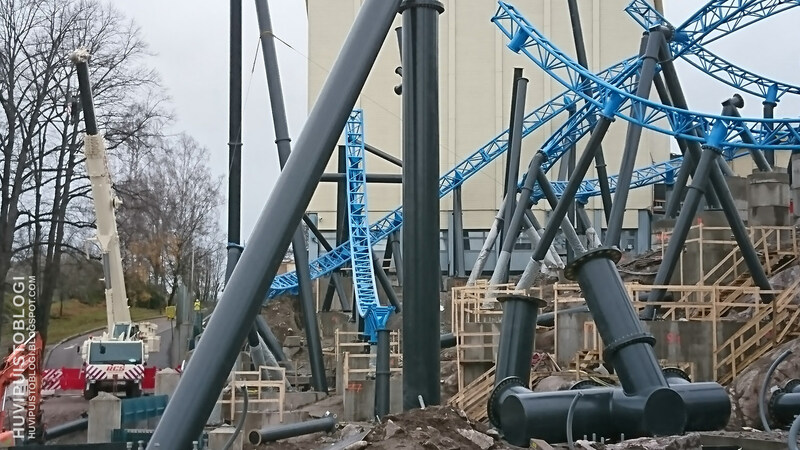 You can see here, that the one missing support for the turn next to the immelmann has now been installed, confirming our theory that is was missing because of spacerequirements. If you look closely here, you can see the supports that are for the turn-arounds into the second launch. You can even see supports for the launch (next to the yellow truck/machine). When I was at the site looking, one of the workmen started chattning with me. I had a great view of the construction, but he asked me to only take photos from the sidewalk. I asked him some small questions, and he said that they are a bit behind schedule. He was really nice, and said that even though they are behind schedule, it will still be opening next summer. 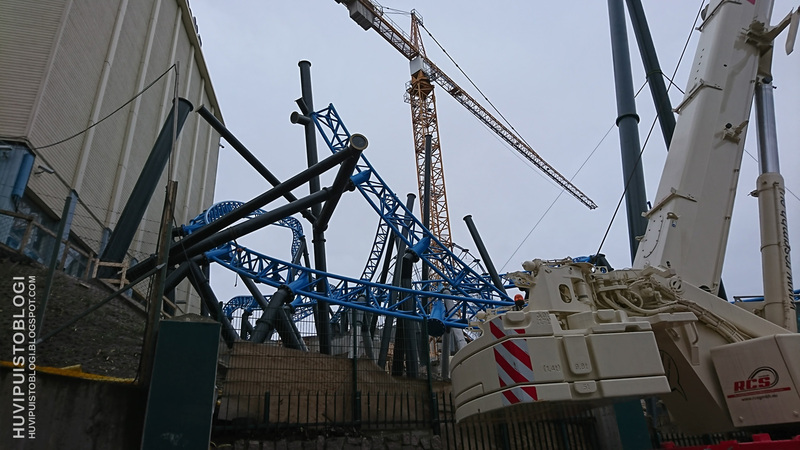 They are also almost finished with all the track on this side of the layout, so soon they will start moving construction to the launch/helix-are next to tulireki. In two weeks, they have acomplished a lot of work, so I speculate that if winter isn't harsh we can see the layout finished before newyears/febuary. They are already like 40% done with this coaster, and the last remaining areas shouldn't be too time-consuming. Benenen, Hutch, Ethan and 7 others like this. Wow that Immelmann is a lot larger than I was expecting! I was expecting an Icon-sized Immelmann to be honest. This ride will be epic!